Back in June 2010, I reviewed my first LED flashlight on ModSynergy and the Dorcy flashlight got me hooked on LED flashlights as a hobby. That rechargeable LED flashlight was a thrower and got me intrigued with the world of flashlights. Flashlights have come a long way from incandescent models that are taxing on batteries and not as bright to the new high power LED variants that are much more powerful and also capable of being powered by a single AA battery you can pick up just about anywhere. Today another Dorcy model makes its way through my hands in the form of the Dorcy (46-4415) MetalGear 160-Lumens 3xAA LED flashlight. The model is reminiscent of the older large incandescent flashlights that used to need those big D sized batteries to operate. Well this one contains a high-power LED that Dorcy says is a lifetime bulb, never needing to replace, and operates on just 3xAA batteries -- the types that you can purchase anywhere. It has an aluminum alloy metal body as the name suggests, meaning its extremely strong and we'll see if this throw-back type flashlight is a step beyond previous generations. From the Dorcywebsite it states that they are 'the leading edge consumer goods marketer of flashlight and lanterns'. Dorcy is a privately held company that operates in Columbus, OH and has been in the business for over 55 years. Dorcy products can be found easily at Sears, Wal-Mart, ACE Hardware, TruServ and Target locations across the United States of America. The Dorcy (46-4415) MetalGear 160-Lumens LED flashlight is powered by three AA batteries, and is simplified by having just one on/off button. The 160 Lumen LED Metal Gear Flashlight features an intense beam of light, allowing for light projection of over 200 feet. The flashlight is constructed of anodized aluminum for greater durability. This flashlight features a built-in battery indicator light: green indicates that there is more than 20% battery life left, and red indicates that there is less than 20% battery life left. The flashlight contains a side mounted push button switch, and complete 3 AA cell batteries. The unique aluminum alloy metal body suggests extreme durability and it contains an lifetime never replace LED, making this flashlight stand apart from other competing torches on the market. The Dorcy (46-4415) MetalGear flashlight comes in those dreaded plastic blister packaging that I despise because they are sometimes difficult to tear apart. A tab is located at the top that helps place the flashlight easily on showroom shelves. The nice thing about plastic see-through packaging is that you can see the full product and not have it hidden like some products are. Dorcy designers do a nice job with the popping red color insert and product features displayed beside the actual flashlight. On the back of the package contains a little more features about the product, warning, and warranty disclaimer. The actual flashlight is made in Taiwan. Opening up the package, there isn't really too many items. What you get is the Dorcy MetalGear 3xAA LED flashlight and three Energizer batteries so you can get up and running right away. Nothing else is included, no holster holder, no wrist strap (meaning it doesn't sport one), no replacement rubber o-ring gaskets. The disappointing thing is that the Dorcy MetalGear has no eyelet for a wrist strap, meaning there is no way to prevent it from falling if it slips out of your hands. Thankfully with the sturdy aluminum alloy metal construction, the flashlight has impact resistance from falls up to 3 feet. It's a very strong flashlight once you've felt it so it should be able to withstand punishment. The Dorcy MetalGear 3xAA weighs in at roughly around 12oz in weight, and measures in at 8 3/4" L x 1 1/2" W in dimension. It fits in your hand comfortably, even though it's pretty thick. There is also some heft to it and definitely can be used in emergency attacks if needed. The flashlight is as big as some TV remotes. Two things missing that I would have liked is a holster for the flashlight to protect it further and a wrist strap, however, the MetalGear does not have an eyelet for wrist straps, which is disappointing. The Dorcy MetalGear 3xAA contains a high-power LED, however, it's using a generic LED with no name brand on it, unlike the other Dorcy and JETBeam flashlights I reviewed previously with the popular CREE branded LED being used in those cases. 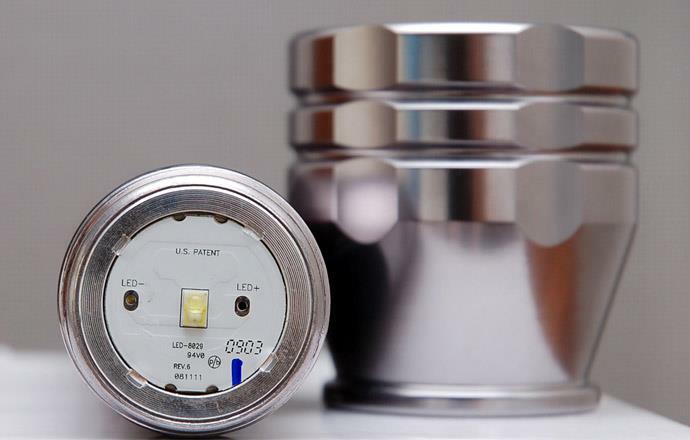 CREE LEDs are the most widely used high-power LEDs as they are known to be high quality and provide amazing power. The Dorcy MetalGear 3xAA specifications call for 160-lumens but it'll be interesting to see how it performs. Consider our last few LED flashlight reviews have been around 145-700-lumens, depending on the battery configuration used, I will compare and see how the MetalGear 3xAA stacks up in comparison. Instead of the typical large sized D sized batteries that were used in comparably sized previous generations of this flashlight, the Dorcy MetalGear uses only 3xAA meaning it operates within 4.5v. Most people will elect to use standard AA batteries and this flashlight is something worth considering for those who are seeking a LED solution that uses widely available batteries. The Dorcy MetalGear 3xAA is the largest flashlight I have reviewed thus far and has a tank of an exterior. The Dorcy MetalGear 3xAA is comprised out of aluminum alloy metal construction and is finished in what looks to be a plated nickel silver color. The finish is very smooth and reflects beautifully when the sun hits the exterior while the color changes. The Dorcy MetalGear 3xAA is extremely strong being able to withstand more scenarios than most people will ever put their flashlights through. Dorcy states on the package that the flashlight has resistance to dropping the flashlight 3 feet. Once you've experienced such an aluminum constructed flashlight such as this one, you'll never want to go back to plastic. Not only will aluminum perform better on impact, it acts like a heatsink and will be better for heat distribution and dissipation, whereas plastic flashlights would trap heat in the flashlight and not be as tough. Disadvantages would be under be cold weather, the aluminum exterior gets very cold quickly. On the body of the flashlight, Dorcy decides to apply knurling (diamond cross pattern) in the lower part of the flashlight where the logo is, however, the knurling is very light compared to the other flashlights I've reviewed. I'm sad to say but the whole flashlight is super smooth and the knurling is too, meaning it doesn't make as much difference in terms of grip as it could have. Using the flashlight for extended periods of time, the flashlight heats up and compound the fact that there are oils on your hands, sometimes handling of the Dorcy MetalGear 3xAA becomes slippery. Having a really smooth exterior, greasy fingerprints are easily spotted on the exterior. I have a feeling this is due to the plating. With no wrist strap being able to be installed on the Dorcy MetalGear, the can roll off tables despite the head of the flashlight having some flat edges. Inserting batteries inside the Dorcy MetalGear 3xAA is simple. Simply unscrew the back section of the flashlight and the plastic 3xAA holder slides out for you to insert batteries into. This back section has a spring, so sometimes putting back this back end can take some tries. The tension is very tight and you need to push in and twist in order to close. One of the neat things about this flashlight is that it can 'tailstand'. Tailstand meaning you can stand it up and have it illuminate the room you are currently in. Some flashlights do not have this ability and it's really a great attribute for all flashlights to have, however, in reality the beam isn't strong enough to illuminate, more on that later. The flashlight can be taken apart into 2-pieces revealing three main pieces; you have the lower battery cover portion, the actual battery chamber fuselage that also contains the LED embedded at the top, and the top portion that unscrews for access to the lens and reflector. The lower battery cover portion showcases the rubber gasket. You can also see in the gallery that the screw threads are not the smoothest. The plating of color did not go on 100% and there are some chips as evidence. The flashlight comes lightly pre-lubricated from the factory. Lubrication on the threads is important in such flashlights to provide a clean and easy fit, and good seal for the rubber gaskets. There is no mention of waterproof ratings or anything of that nature, but the flashlight contains rubber o-ring gaskets, so I'm sure there is decent protection from dust and exterior liquid like rain. I wouldn't trust using this with submersion in water. There are two rubber gaskets on this flashlight and they should be adequate for basic forms of resistance to dust and liquid, again no mention on the package about ratings for it being waterproof, so technically it's not. But having rubber gaskets, I would envision you can get away with rain on the exterior and dust from penetrating inside. One rubber o-ring protects the battery chamber and the other protects the LED and emitter on the top portion of the flashlight. Screwing on the top portion is easy and does so quietly. The lower portion as I mentioned earlier contains a spring but the tension is very tight and therefore it takes some fight to push the cover on and to twist onto the flashlight. The Dorcy MetalGear 3xAA is a very simple flashlight and some people enjoy that. There is only one rubber booted push button switch on the flashlight that controls the on and off function. There is only one level of brightness on the MetalGear and clicking the second time shuts it off. The on/off button provides an audible click that is common. The button doesn't have to travel far to execute the commands. Using three AA batteries, Dorcy rates the runtime of the MetalGear 3xAA up to 20 hours depending on the capacity of the battery used. Above the rubber booted push switch lies the power level indicator LED. When battery life is good, a green LED shows, when the battery is low and needs replacing, the LED lights red. From looking at the front of the flashlight and inside the reflector, I can already see that the Dorcy MetalGear 3xAA is more of a thrower light because the reflector is smooth and has no orange peel effect. If the reflector contained an orange peel looking reflector, it would have been a flood light. This one looks like the Dorcy rechargeable CREE LED flashlight I reviewed a while back, but we'll see if it can perform as well. Not only will I share with you in words my personal experience with the Dorcy MetalGear 3xAA, I will seek to determine if the rated lumens is accurate by way of a digital LUX meter. Tests are completed with a fully charged battery in place. This light may have a strong directional beam, but it's nothing like the other rechargeable Dorcy I reviewed. For how big it is, I am disappointed in the way it performs because the beam width is very small and doesn't illuminate a wide enough angle. The Dorcy rechargeable CREE LED was also a thrower (an amazing one at that) but it had enough output to be also useful. The Dorcy MetalGear 3xAA is rated at 160 lumens but it doesn't feel that way, it feels underpowered and the color cast is manageable but undesirable personally. Under operation the flashlight has good heat dissipation as the whole body from top to bottom becomes warmer, but this makes the flashlight slippery in your hands with the combination of oils in your hands and fingers. I've used this flashlight for close to a year now and the plated paint in some areas has rubbed off and come out. The paint quality is average because the paint is put on very thin. The Dorcy MetalGear 3xAA is a decent LED flashlight, however, it misses the mark in what I expect.